This title was first published in 2003. Presenting information is a vital part of the job of both the medical director and other senior executives in the pharmaceutical industry, and yet the majority receive no training for this. Presentations have to be made internally to colleagues, clinical staff, marketing and product managers and medical sales representatives; and externally to professional medical specialists and NHS staff, the media and the general public. Anyone who manages or communicates adverse news needs to do so quickly and effectively, and be prepared to face difficult questions under media scrutiny. 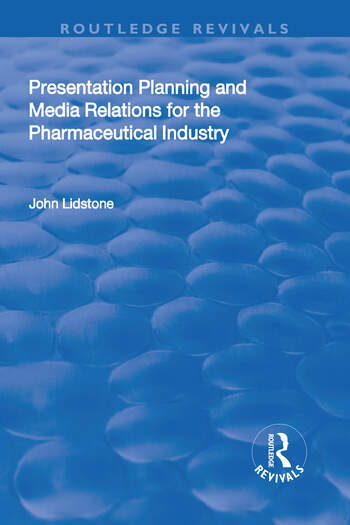 In this book, John Lidstone, an author acknowledged by the industry as an expert in marketing and presentation skills, provides readers with the tools and skills to make their presentations and media dealings a success. The book is divided into two parts. Part One, Preparing and Delivering Formal Presentations, provides extensive practical guidance on the techniques of effective presenting: establishing objectives and preparing the presentation, delivering the opening, core and conclusion, using visual aids and dealing with questions. It also includes a chapter on the skills required for video conferencing. The second part, Handling the Media, contains invaluable insight and instruction for a pharmaceutical executive facing any element of the media. It draws on the author's extraordinary experience and provides examples and advice with direct relevance to the pharmaceutical industry throughout, making this the only specialist book available on the subject. Contents: Part I Preparing and Delivering Formal Presentations: Introduction to Part I; Learning and communication; Preparing your presentation; Beginning your presentation; Conducting your presentation; Ending your presentation; Using visual aids; Video conferencing; Appendix to Part I - audio-visual projection. Part II Handling The Media: Introduction to Part II; Facing the media; Dealing with the press; Preparing for a television interview; The day of the interview; Handling the television interview; Preparing for and handling a radio interview; Guidelines for media interviews; Appendix to Part II - training in media relations. References and recommended reading; Index. John Lidstone is an internationally recognised leader in management and marketing consultancy. He retired as Deputy Chairman of Marketing Improvements Group Plc in 1993, after spending nearly thirty years helping to build it into one of the foremost firms in marketing consultancy, research and training operating throughout the world, following eleven years with the Shell Group and teaching at Repton School. In addition, John was elected a member of the British Academy of Film and Television Arts (BAFTA) in 1981 for his services to management training films. John is also author of Gower's Marketing Planning for the Pharmaceutical Industry.